There is much to contend with as we grow older, including a higher risk for dental disease. One possible contributing factor: dry mouth from a lack of saliva. Also known as xerostomia, dry mouth occurs when the salivary glands secrete less than the normal two to four pints a day. Saliva performs a number of functions, but perhaps the most important for dental health is as an acid neutralizer. Within a half hour to hour after eating, saliva can restore the mouth's normal pH level to prevent acid from softening tooth enamel. When there isn't enough saliva, acid levels stay high leading to erosion of the enamel. This vastly increases the chances for tooth decay. 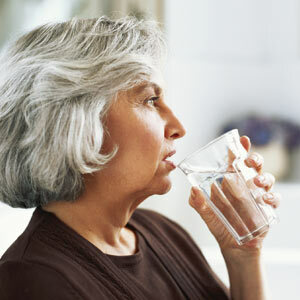 Although there are several causes for dry mouth, one of the more common is as a side effect from certain medications. It's estimated over 500 drugs — many taken by seniors — can cause dry mouth, including diuretics for high blood pressure and heart failure, antidepressants, and antihistamines. Some diseases like diabetes or Parkinson's may also reduce saliva flow, as well as radiation and chemotherapy. If you've developed chronic dry mouth, there are some things that may help restore adequate saliva flow. If medication is the cause you can talk to your doctor about an alternative medication or add a few sips of water before swallowing the pills and a full glass afterwards. You should also drink plenty of non-caffeinated beverages (water is the best) during the day and cut back on sugary or acidic foods. And a cool-air humidifier running while you sleep may also help keep your mouth moist. We may further recommend an over-the-counter or prescription stimulant for saliva. For example, xylitol, a natural alcohol sugar that's found in many gums and mints, has been found to stimulate saliva and reduce the risk of tooth decay as an added benefit. Last but not least, be sure to brush and floss daily to remove disease-causing plaque and see us at least twice a year for cleanings and checkups (if your mouth is very dry, three to four times a year is a better prevention program). Managing chronic dry mouth along with proper oral hygiene will help ensure your mouth continues to stay healthy as you grow older.